Fall is off to a busy start and I'm all about quick recipes lately. This quick ricotta orzo recipe is a one-dish dinner that's both satisfying and simple. Even in the warmer months, there are still some days when I crave the heaviness of comfort food. After a long day in a long week sometimes all I really want to eat is a bowl of mac and cheese. Oh, and I want someone else to make it for me. And since that's not happening (unless it's my husband making a box of the powdered cheese kind), I need to find an alternative. And this ricotta orzo is it. Ricotta is a perfect shortcut ingredient for getting a rich and creamy sauce with very little work. All it requires is some heat, a little seasoning, and maybe some pasta water and you've got yourself a silky cream sauce for any pasta. In this case, it's orzo. I love the small shape of orzo and how it keeps that great chewiness. 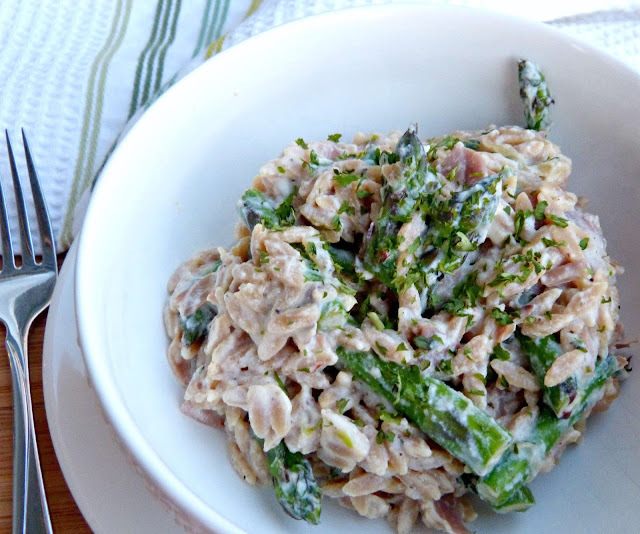 Paired with creamy ricotta, some fresh asparagus, and salty prosciutto it also takes on a risotto-like quality. 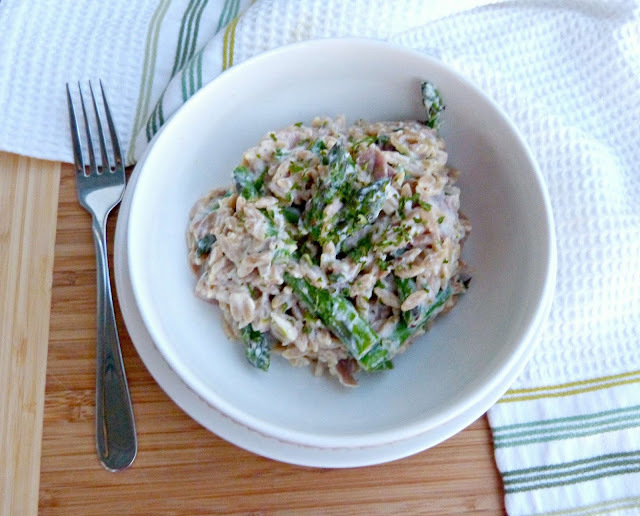 And let's be honest, risotto is serious comfort food. Make your weeknight dinner a little more comforting with this quick, easy, and hearty pasta meal. Bring water to a boil in a large pot and cook orzo according to package directions. When there are 3 minutes left in the orzo cooking process, add asparagus to the boiling water and cook for the remainder of the time left. Reserve 1/2 cup of pasta water, drain well and set aside. Meanwhile, heat olive oil and butter in a large skillet over medium heat. Add shallots and saute, stirring frequently for 5 minutes. Stir in garlic, red pepper flakes, and thyme and saute for another 1-2 minutes, stirring constantly to prevent garlic from browning. Reduce heat to low and add ricotta and lemon juice to the pan. Whisk all ingredients together until smooth and add in any reserved pasta water as need to create desired consistency. Simmer on low for 4-5 minutes, stirring until all ingredients are incorporated and the sauce has thickened slightly. Season with salt and pepper. 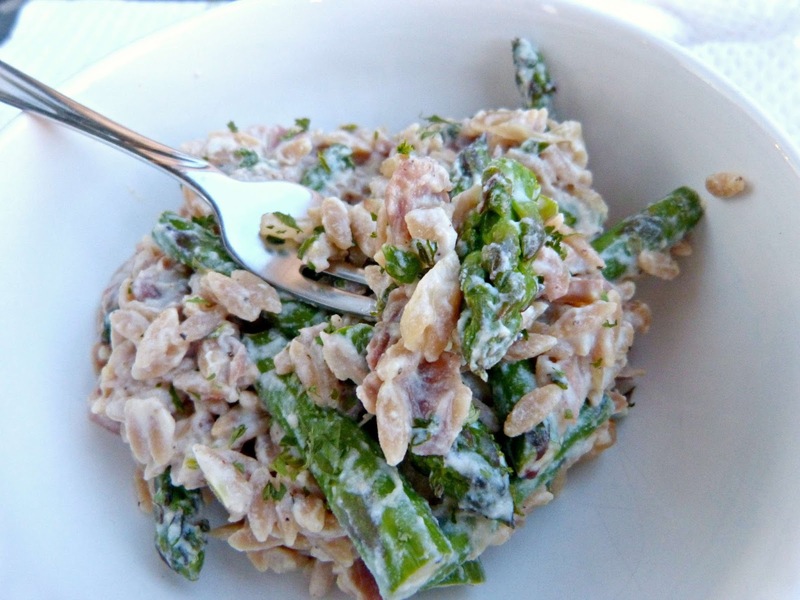 Toss cooked orzo, asparagus, and prosciutto with the ricotta mixture. Stir well to coat. Serve warm. I'd eat it any time of year, but especially now when we're transitioning between seasons. Agreed! It's the perfect time of year for this-- especially while asparagus is still good!